Canari Cyclewear has partnered with Susan G. Komen™, to produce a line of great looking "Pedaling for Pink" cycling jerseys and shorts. 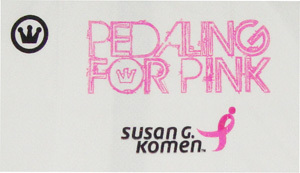 Besides producing a line of great looking Susan G. Komen™ cycling items, Canari has donated $25,000 to Susan G. Komen for the Cure™. 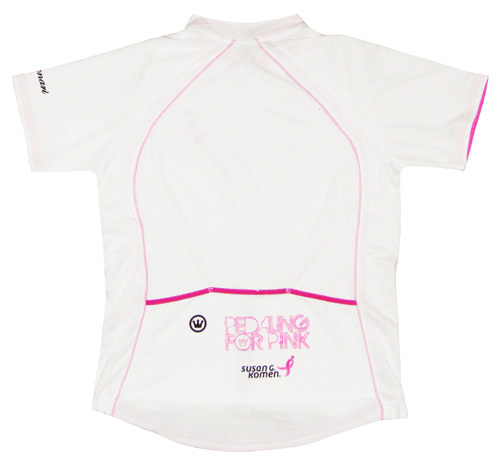 In addition, LOVE2PEDAL will donate an additional 10% of the sale price for every "Pedaling for Pink" jersey sold. FABRIC: A high tech wicking fabric creates a push/pull affect to force moisture away from the body and pull it to the face of the fabric allowing it to evaporate quickly keeping cooler, drier and more comfortable. Jersey is machine washable (hang to dry). --One of the great looking Susan G. Komen 'Pedaling for Pink' jersey models. It is white with pink trim (at sleeves, collar, pockets and stitching). It also features a pink embroidered Pink Ribbon logo on the front and other logos on the rear pockets as pictured above.